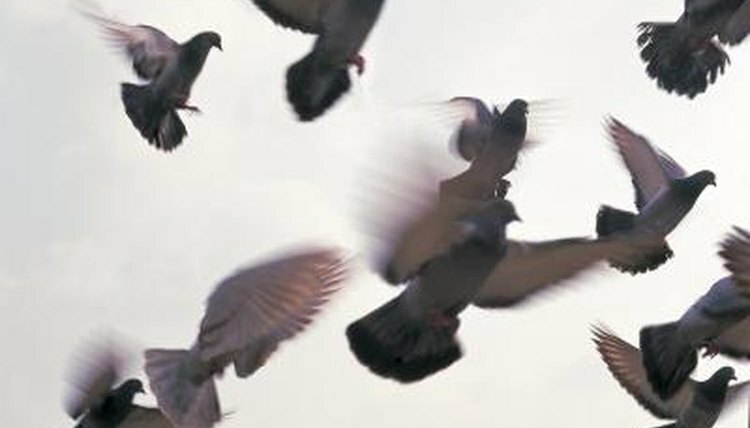 Pigeons are a successful and adaptable group of birds that thrive in varied habitats. Most of the pigeons commonly seen in cities in the United States are feral rock doves (Columba livia), descendants of birds first brought to America from Europe in the 1600s. Sometimes also called rock pigeons, these birds make their homes in a variety of habitats throughout the world, but many have adapted to life with humans. Pigeons thrive in cities where humans create buildings that pigeons are able to adapt for their own use. Tall buildings and window ledges simulate the natural cliffs where wild pigeons live, and the birds use these man-made spots to roost, loaf and build their nests. City birds scavenge from the trash and from pet food dishes left outside, and they will pick up any dropped bits of food that they find. It’s also common for people to feed city pigeons bits of bread, crumbs and birdseed. Cities aren’t the only place that pigeons can thrive. Where in the wild they might have used cliffs and caves, in rural and suburban areas pigeons are quick to move into open barns and abandoned homes, under bridges and around other available human structures. They eat spilled grain, garden waste and animal food, as well as any other foods that present themselves. These birds sometimes make a nuisance of themselves by living and feeding around farms and grain storage elevators. In the wild pigeons often live on or near large, rocky cliffs. They typically build their nests on the faces of these cliffs, presenting a challenge to many would-be predators. Pigeons also live inside caves, near the opening, when these are available. In the wild they mostly eat seeds and grains, but will also eat fruit, insects, slugs, snails and even small lizards. Both parents take turns incubating the eggs, and it’s not uncommon for pigeons to return to the same nest year after year, making a new nest on top of the old one. Pigeons live in almost every part of the world. They inhabit forests such as rainforests, temperate deciduous forests, swamp forests and arboreal forests. Pigeons inhabit desert areas where the get water by eating succulent plants, and they also live on islands, in mangrove forests, in chaparral and in almost every other environment on Earth. The only places where pigeons haven’t settled in are the high Arctic and Antarctic regions. In areas where food is plentiful and the environment is favorable, pigeons may live in groups of hundreds or even thousands of birds.